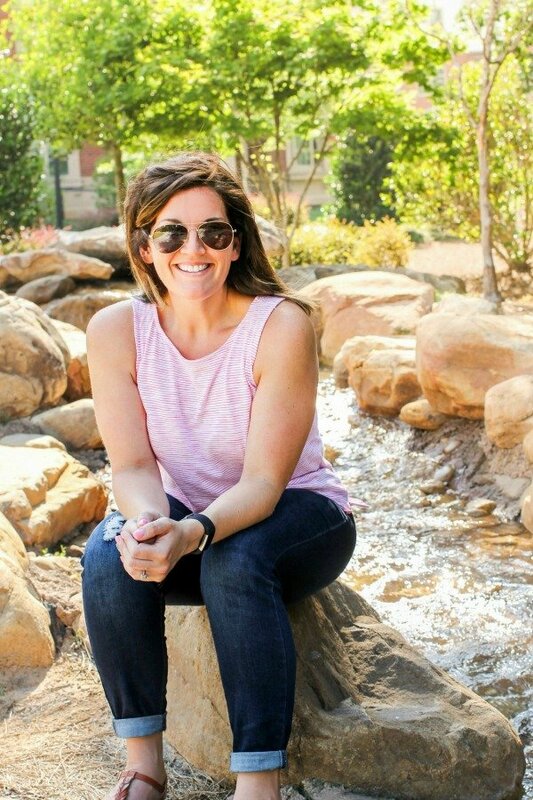 July 16, 2018 By Allyson 18 Comments This post may contain affiliate links. Read my disclosure policy. 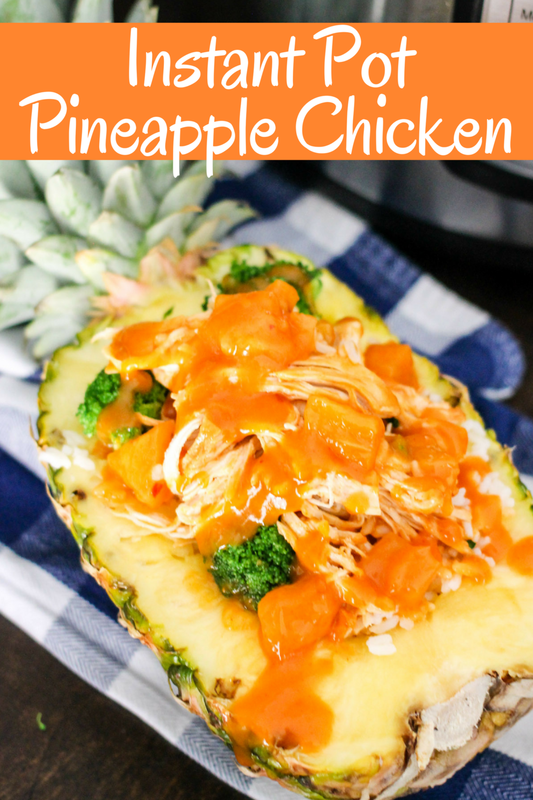 Instant Pot Pineapple Chicken is an easy and delicious family friendly meal that is done in minutes and only uses one pot! 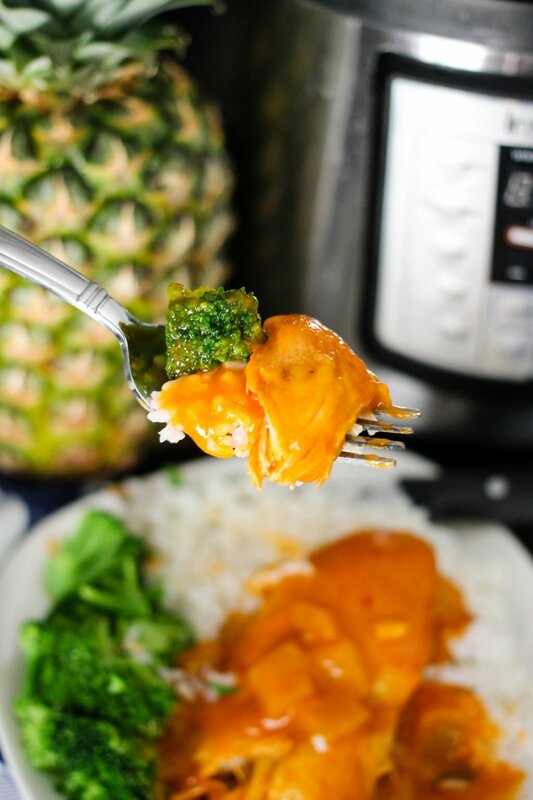 Instant Pot Pineapple Chicken is a meal solution worth trying. The sweet sauce with flavors of coconut and pineapple, is perfect on top of the delicious moist chicken breast. The serving options are endless (see below), and the whole family will love this simple meal. Throw everything in the Instant Pot and let dinner make itself! In the Instant Pot, combine all the sauce ingredients, then add the pineapple chunks and chicken breast to the pot. Make sure you spoon the sauce over the chicken so that it’s covered. Cook on manual for 6 minutes, then naturally release the pressure (don’t flip the pressure release) for 10 minutes once the timer is done. Flip the pressure valve to release any remaining pressure, then open the top. You should remember when using the Instant Pot, that the time it takes to cook the recipe (6 mins), is not the total time of the recipe. You need to give the pot some time to ‘come to pressure’. Remove the chicken from the instant pot, transferring to a cutting board to shred, or a plate if leaving whole. Turn the pot’s function to ‘saute’ and add a cornstarch slurry to the sauce. Whisk to combine. Cook for 2 minutes, whisking occasionally, and allow the sauce to thicken. Turn off and serve sauce over chicken. Add all the ‘instant pot’ ingredients to the slow cooker- cover and cook on low for 7-8 hours or high for 5-6 hours. Once the time is up, add the cornstarch slurry to the crock pot, stir, cover and cook on high for 30 minutes and the sauce should thicken up! Serve pineapple chicken whole over rice. Spoon the delicious sauce over the rice and chicken and enjoy a saucy rice bowl. Shred the chicken breasts, then serve shredded chicken over rice or quinoa. Shred chicken breasts and serve in lettuce wraps for a low carb option. Shred chicken breast and make a wrap using a tortilla. Add lettuce for an added crunch! Use shredded chicken breast over a big salad. Use the rest of the sauce as the dressing – YUM! Add rice, broccoli, shredded chicken, and sauce into a pineapple ‘bowl’ for an awesome presentation. This is definitely the most fun way to serve pineapple chicken! 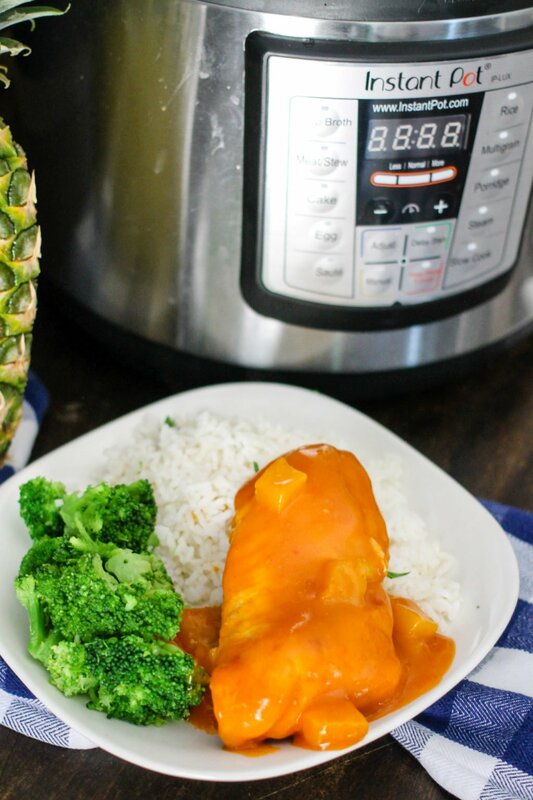 Using at least a 6qt Instant Pot, this pineapple chicken recipe definitely can be doubled. Using an 8qt instant pot the recipe can be tripled. Is Instant Pot Pineapple Chicken Healthy? Pineapple chicken is a healthier alternative to take-out and restaurant dishes where you might not know the ingredients going into the food. I suggest using a lower sugar BBQ sauce when making the sauce, such a Stubbs Original because it will save you a lot of calories and sugar than some other brands. With 291 calories, 11g of fat, 22g carbohydrates, and 28g protein per serving, it is a great option for someone watching what they are eating, and can be served in healthier ways such as in salads or in lettuce wraps. To reduce calories and fat further, try using a lighter coconut milk. It won’t bring over all the coconut flavor, but it will drastically save calories and fat using an unsweetened version. Instant Pot Strawberry Jam has only four ingredients in this super simple and delicious! Add coconut milk, BBQ sauce, red pepper flakes, and salt to the pot of the instant pot. Whisk to combine. Add pineapple chunks and chicken breasts to pot. Mix to cover chicken with sauce. Close the top, seal the pressure valve, and set on manual (high) pressure for 6 minutes. When time is finished, let the instant pot 'naturally release' (do not flip valve) the pressure for 10 minutes. After 10 minutes, flip the valve and then carefully remove the top. Switch instant pot to 'saute' function. Remove chicken from the pot and set aside. In a small cup add cornstarch and water, mix completely. 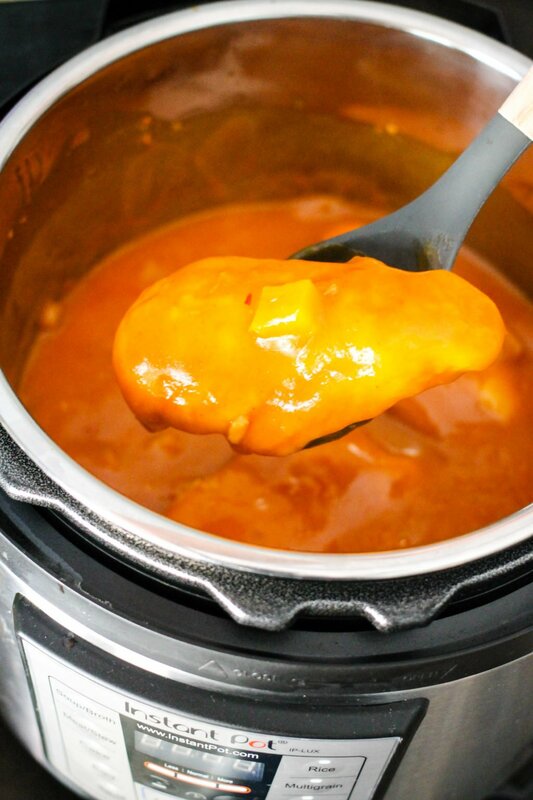 Pour mixture into the instant pot and whisk to combine with sauce. Whisk occasionally for about 2 minutes or until the sauce has thickened. Turn instant pot off. Serve the chicken as desired topped with the sauce. I love getting great IP recipe recommendations! Can’t wait to try this one! So yummy with rice! Perfect summer dish! This looks like the perfect dinner! My kids will love it! This dish has all the ingredients I love! I love that this is made in an instant pot! I have to give it a try! I just got an Instant Pot and I’m looking for more recipes for it, so this is perfect! Made this tonight and it was delicious… a big hit! I was concerned I would get the dreaded ‘burn’ message because the sauce isn’t really all that thin. It did take awhile to come to pressure and the chicken itself was a bit scorched on the bottom, but it finally pressurized and cooked just fine. That sauce is to die for! Thanks much for a great recipe…I’ll be making it again. I am so glad it worked out for you. My sauce was pretty thin, did you add enough coconut milk? You could always thin it out a bit ore next time, because it thickens A LOT when you add the cornstarch at the end on the saute mode. You are so welcome! The days just get shorter it seems anymore… My Instant Pot and I are becoming SO close! LOL This is a dish I can get my girls to eat! Yum this sounds amazing!! Thanks for sharing! That looks so yummy and it’s a bonus that it’s so simple to make! I can’t wait to give this a try! Looks really good for dinner any night! 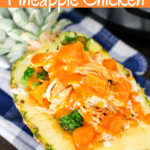 I noticed in the short video that accompanies this recipe that the pineapple is put in first at the bottom of the pot, chicken breasts layered on top of pineapple, then the sauce poured on top of everything. The written directions say to put the sauce ingredients in first. I was looking for the perfect first recipe to try in my new pot and I believe this is it! However, I’ve been reading tips about always putting the sauce on top to avoid the burn message and not to stir things up, just to layer. Should I follow the video (pineapple, chicken, sauce) or is it really ok to mix sauce first in the pot? Hi Joanna! Thanks for asking! It can be done either way, but it will get mixed up despite how you layer it because the pressure knocks everything around inside the pot. I always make my IP recipes with the sauce on the bottom, because the IP NEEDS the liquid to come to pressure. If you have too many solid ingredients on the bottom (such as full size chicken breasts) it won’t come to pressure and it could burn. Add the sauce first, then the chicken or pineapple – up to you on the chicken and pineapple. I have never once had a burn signal on my IP and this has enough liquid that it shouldn’t be an issue. Please let me know how it turns out! You should try these too – it’s a no fail recipe and one of my most popular Instant Pot recipes! I don’t have an instant pot, but this sounds delicious. Is there any conversion for making possibly in a crock pot or even in the oven? Definitely! Add all the ‘instant pot’ ingredients to the slow cooker- cover and cook on low for 7-8 hours or high for 5-6 hours. Once the time is up, add the cornstarch slurry to the crock pot, stir, cover and cook on high for 30 minutes and the sauce should thicken up! very creative and unique, a dish served in pineapple!